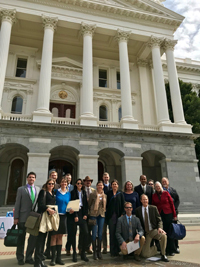 Cal-IPC Board of Directors at the Capitol advocating for AB 2470 in February! Assembly Bill 2470 was passed unanimously on the State Senate floor on August 29, 2018, and signed by Governor Brown on September 28, 2018. The bill, authored by Assembly Members Tim Grayson (Concord) and Lorena Gonzalez Fletcher (San Diego) codifies the state’s interagency Invasive Species Council of California (ISCC). Earlier in the legislative session, we secured $2M in new funding for invasive species work at the California Dept. of Food & Agriculture (CDFA). Now that AB 2470 has passed, CDFA and other partners have allocated the new funding to support the state’s network of Weed Management Areas (WMAs) via a request for proposals (see below). More than eighty organizations submitted letters of support for AB 2470 and WMA funding (see all groups on our sign-on letter here). We greatly appreciate the support — we could not have done this without you!